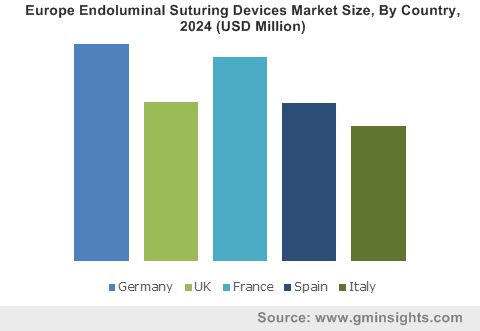 Endoluminal Suturing Devices Market size was valued at USD 29.3 million in 2017 and is expected to witness more than 12.8% CAGR from 2018 to 2024. Increasing prevalence of chronic diseases such as will boost market growth during the foreseeable future. Adoption of unhealthy diet and alcohol abuse along with sedentary lifestyle are the major causes of growing incidences of obesity. According to World Health Organization (WHO), in 2016, about 650 million people suffered from obesity. High prevalence of obesity will lead to high adoption rate of endoluminal suturing devices during the projected timeframe. Continuous rising chronic disease incidences will have significant implication of healthcare resources, thereby accelerating industry growth. Growing demand of minimally invasive techniques will boost demand for endoluminal suturing devices over the forecast period. Precise suturing in tight spaces and reduction in surgery morbidities will lead to increasing demand for endoluminal suturing devices. Advantages associated with minimally invasive surgeries such as smaller incision length, less discomfort, shorter hospitalization stay and less blood loss during surgery make it a preferable treatment option, thereby propelling industry growth throughout the forecast timeframe. Technological advances in endoluminal suturing devices offering essential treatment is expected to boost market growth during the forecast timeframe. Advances to minimize undesirable effects such as will propel industry growth. For instance, Apollo Endosurgery Inc., developed minimally invasive overstitch suturing devices for implantation of full-thickness sutures via a flexible endoscopic surgery. Such advancements will propel endoluminal suturing devices industry growth during the projected timeframe. Bariatric surgery market accounted for USD 10.3 million in 2017 due to increasing number of obesity cases across the globe. 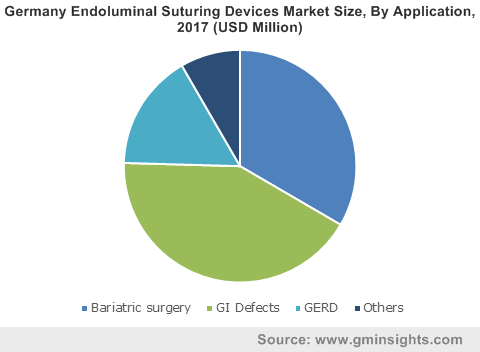 Increasing number of obese patients coupled with improved product design will boost endoluminal suturing devices market demand over the forecast period. Various technological advances development of next generation suturing devices and improving patient outcomes will spur demand for endoluminal suturing devices in forthcoming years. Gastrointestinal defects market will expand at 12.7% CAGR during the forecast timeframe. 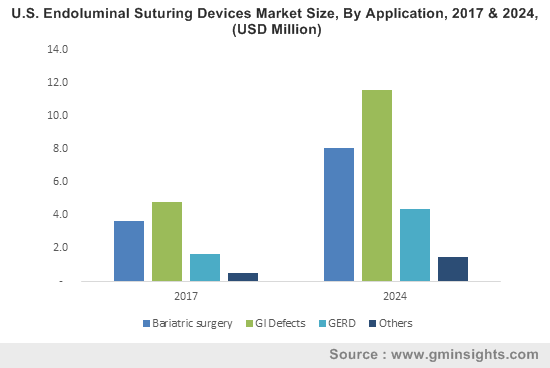 As number of people suffering from gastrointestinal defects is increasing, the demand for endoluminal suturing devices will increase in the future. Furthermore, increasing prevalence rate of acute perforations and chronic fistulas will lead to escalated demand for endoluminal suturing devices for Increasing demand for cost effective and minimally invasive techniques for weight reduction will spur endoluminal suturing devices market growth. Endoluminal suturing devices hospitals business will grow with a rate of 12.8% during the forecast timeframe. High growth rate is due to growing burden of obesity across the globe. Moreover, New clinical trials conducted in multi-speciality hospitals will provide opportunities to the patients to explore new experimental therapies, thereby fostering segmental growth. Growing burden of chronic diseases and development of healthcare infrastructure will favor segmental growth in the future. Endoluminal suturing devices use in ambulatory surgical centres accounted for revenue of USD 8.6 million in 2017. The segmental growth is attributable to increasing demand for short hospital stays and economical treatments for treatment of chronic conditions. Ambulatory surgical centres lower procedural costs and offer single day obesity treatment that will favour growth of ambulatory surgical centres market in the upcoming period. U.S. endoluminal suturing devices market contributed to largest revenue of USD 10.7 million in North America in 2017. High prevalence of chronic conditions such as obesity cases will be the major factor for U.S. growth. As per the estimates of Organisation for Economic Co-operation and Development (OECD), about 47% of the total population suffer from obesity in 2017. High burden of chronic diseases should drive industry growth in the future. Indian endoluminal suturing devices market is forecasted to expand at the rate of 16.5% CAGR across the forecast timeframe owing to increasing prevalence of GERD. According to a study published in National Journal of Community Medicine, about 23.6% of the population suffered from gastroesophageal reflux disease. Moreover, escalating medical tourism to treat conditions such as obesity due to significant improvement in quality of healthcare amenities and lower cost is expected to favor industry growth. 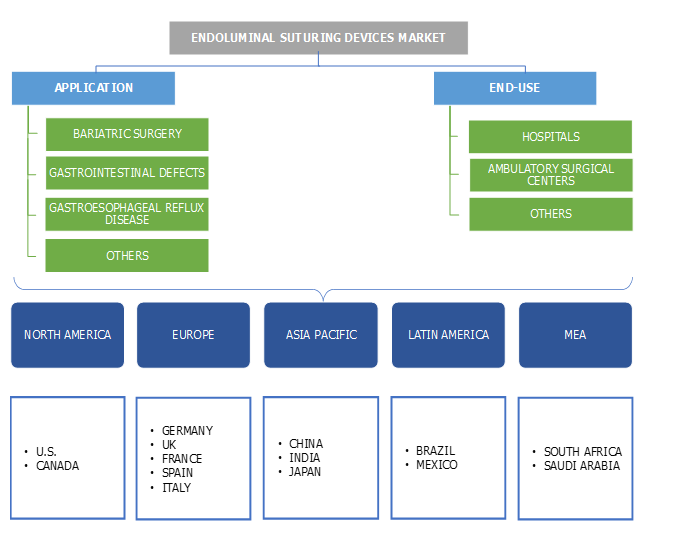 Few of the notable industry players operating in global endoluminal suturing devices market are Apollo Endosurgery, Inc., Medtronic and Johnson and Johnson (Ethicon Endo-Surgery, Inc.). These companies adopt strategies such as mergers and acquisitions, novel product launch to foster business in endoluminal suturing devices industry. For instance, in March 2016, Apollo Endosurgery launched OverStitch endoscopic suturing system device to Australia. This strategy will expand the company's geographical presence. Suturing devices have been in use for treatment of obesity and gastrointestinal defects since 2008. Endoluminal suturing devices is a relatively new and emerging market. Only a handful of companies offer endoluminal suturing devices and many are in process of clinical trials and approvals. The industry is expected to grow significantly over the next few years owing to increasing number of patients suffering from gastrointestinal defects and obesity. With growing influence of minimally invasive surgical procedures, the demand for endoluminal suturing devices is expected to increase in the future. Recently, Ethicon Endo-Surgery, a subsidiary of Johnson and Johnson received FDA approval for launch and marketing of Proxisure suturing devices. Major players are trying to make full use of less competition in the market and capture major share of the market.